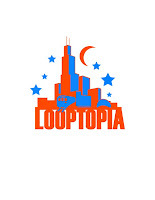 This year's Looptopia, Chicago's "all-night cultural celebration," is coming up on Friday, May 2. The music lineup includes some cool local bands and artists that you'll want to check out. Below is some more information on some of these acts, and where/when they will be performing during the event. For a full music lineup, click here. Bang! Bang! is a co-ed Chicago band that have earned themselves a reputation as one of the city's best live rock acts. They were recognized in 2006 as one of New City's Top Ten Bands on The Verge. Daley Plaza, 5-5:30 p.m. Flowers for Dorian is a rock band that won MTV's 2007 "On the Rise" Artist Award. Federal Plaza, 11-11:45 p.m.
May Or May Not explores progressive indie pop through swirling synths, grinding guitars, ear-catching melodies and colorful psychedelic lights. Daley Plaza, 7:20-7:50 p.m.
TAFKAVince & Lauren are an acoustic country/folk duet with a bit of glam, performing footstompin' to heartbreakin' songs. Blick Art Materials, 8:15-8:45 p.m.
White Hot Knife exploded onto the scene and have stayed in the spotlight ever since. Their sound can be described as "post romantic electro rock defined by chic bass-driven melodies." They have enjoyed a lot of success, and frequently airplay on stations such as WXRT and Q101. Federal Plaza, 9:30-10 p.m.